Seven Lakh Farmers, 600 Crore Apple Industry, Zero Insurance! (MENAFN - Kashmir Observer) If anything appropriately exemplifies the vulnerability of Kashmiri apple growers to the vagaries of weather, it is the video of an apple farmer who was filmed while he wailed over the damage caused to his apple crop by an untimely snowfall in early November last year. Kashmir witnessed an untimely heavy snowfall on November 3, 2018 which caused huge damage to apple growers with some estimates putting the losses suffered by Kashmiri apple farmers at over 500 crore rupees. Apple growers were the hardest hit as the snowfall didn't only damage the apple crop, but also the branches of apple trees which were laden with leaves and apples, thus making them crumble under the weight of snow. The sudden snowfall also disrupted the transportation of Kashmiri apple to outside states as the national highway remained blocked for several days due to extreme weather. This is not the first time Kashmiri apple farmers had to suffer economic losses because of an extreme weather event. Farmers in Kashmir, especially the apple farmers, have been suffering because of vagaries of weather such as unexpected snowfall, heavy rainfall, hailstorms or lack of rainfall for years now. The extreme weather events get repeated almost every year leaving the farmers high and dry. The worst damage in recent years was caused by the 2014 flooding in Kashmir. 'When I visited my orchard after the snowfall in [early] November, I could not control my emotions as I saw my entire apple crop under the snow,' said Ghulam Ahmad, an apple grower of Shopian. Ahmad said that many of his apple trees were also damaged by the snowfall. 'We take care of our apple trees almost like our children. It takes us several years to nurture an apple tree until it starts bearing fruit. But, the untimely snowfall this year consumed a dozen of my apple trees,' Ahmad said. 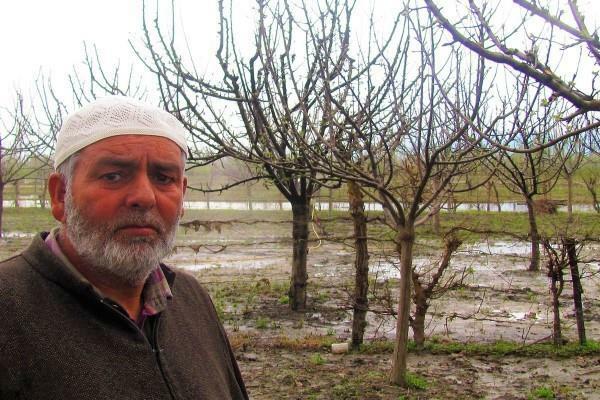 Mohammad Shafi Lone, an apple farmer of Sopore said that it would be hard for him to pay the school fee of his three children this year owing to the losses he suffered because of the early snowfall. 'Though I had harvested and sold over 60 percent of my yield, the damage to the remaining produce would hurt me economically throughout 2019,' Lone said. 'We farmers depend entirely on our apple crop. Any damage to our crop causes problems for us,' Lone added. According to a vulnerability assessment study , carried out by government of India's Department of Science and Technology (DST) about 12 states in Indian Himalayan Region (IHR), Jammu & Kashmir is one of the first three most vulnerable states to climate change impacts in India, the other two being Assam and Mizoram. 'Our study reveals that Jammu and Kashmir has the third highest vulnerability ranking among the Indian Himalayan States, mainly because it has no area under crop insurance, its most geographical area is under sensitive slope, it has least road density, low percentage of area under horticulture crops, relatively low participation in Mahatma Gandhi National Rural Guarantee Scheme, low livestock to human ratio and low percentage of women in the overall workforce, among other factors,' said Majid Farooq, an environmental scientist working with Jammu and Kashmir government, who participated in the study. Scientists working on impacts of climate change across Kashmir Himalayas say that the impacts of changing climate are already visible on ground as erratic weather patterns are often occuring now as compared to the past. 'For example, the snowfall now occurs either at the most unexpected times (such as in February, March or November) or doesn't occur at all like we saw in some years in recent past,' said Shakil Ahmad Romshoo, head of the Earth Sciences Department at the University of Kashmir. According to experts like Romshoo, the government should help farmers adapt to the changing climate through its state action plan on climate change and should also provide insurance cover to farmers against climate related risks. However, farmers say, the government has so far failed to bring farmers of Kashmir region under any insurance cover. The apple growers and saffron growers are particularly clamoring for insurance cover considering the vulnerability of apple crop, apple trees and saffron crop to extreme weather events. 'If I had the insurance cover, I wouldn't have to worry about the damage to my crop. But the government is unable to provide us the insurance cover,' said Mohammad Akbar Mir, a farmer of Kashmir's apple town Sopore. Bashir Ahmad Bashir, the president of Apple Growers Association in Kashmir, said that despite untimely snowfall wreaking havoc with apple crop several times in recent years and frequent droughts and erratic rainfall causing damage to apple crop, the government has failed to implement the Insurance Scheme. 'The government could not do it despite the fact that the state cabinet of the previous government had approved it,' Bashir told this writer. 'We are being treated unfairly. This is the only way I can describe the treatment we are getting,' he added. The flagship agricultural insurance schemes, Pradhan Mantri Fasal Bima Yojana (PMFBY) and the restructured Weather-based Crop Insurance Scheme (WBCIS), have been implemented across India since 2016, but due to higher premium charges quoted by insurance companies for farm land in Kashmir, these schemes are yet to provide any help to apple, saffron and rice farmers in the region. Jammu & Kashmir's secretary of horticulture department, Manzoor Ahmad Lone, said that the government is in the process of implementing WBCIS. 'We had tried very hard to get the insurance companies for insuring the horticultural crops such as apple. But they were adamant that they will insure the crops on the basis of weather rather than yield. Also, there were issues regarding the premium due to which the insurance scheme couldn't take off so far despite our efforts since 2016,' Lone told this writer. . He said that farmers are compensated in terms of yield shortfalls through PMFBY while WBCIS scheme provides insurance cover to farmers against adverse weather events. Jammu & Kashmir's horticulture industry (largely apple industry) is hailed as one of the very few industries which has flourished despite the ongoing armed and political conflict in Kashmir over the past three decades. According to Jammu & Kashmir government, horticulture sector contributes significantly to the state economy and is a source of livelihood for 3.3 million population. About seven lakh families are directly or indirectly involved and dependent on the horticulture sector, the government estimates say.Horticultural production of 1.83 MTs in 1972-73 has risen to the level of 24.94 LMTs with turnover of 6,000 crore rupees approximately during 2015-16 in the state, the government estimates say. Horticulture sector, as per these estimates, also provides jobs to other related trades such as the ones trading in fertilizers, pesticides, machinery and fruit processing.